KEMP Technologies products optimize web and application infrastructure as defined by high-availability, high-performance, flexible scalability, security and ease of management. They maximize the total cost-of-ownership for web infrastructure, while enabling flexible and comprehensive deployment options. 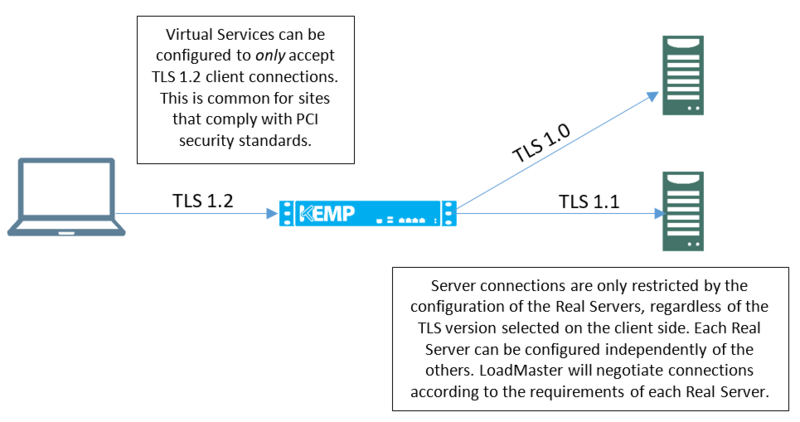 This document describes various aspects of SSL Accelerated Services using the KEMP LoadMaster. It describes in detail how to configure SSL Accelerated Services using the LoadMaster Web User Interface (WUI). This document is intended to help anyone who wishes to learn about or implement the SSL Accelerated Services within the KEMP LoadMaster. This section will explain how to create a Virtual Service with SSL Acceleration activated. SSL Acceleration transfers the processing of SSL from the Real Servers to the LoadMaster, meaning that only one certificate is required per Virtual Service. When SSL Acceleration is enabled, communication from the LoadMaster to the Real Servers is unencrypted. The process for adding an SSL-enabled Virtual Service is the same for a regular Virtual Service. First, add the Virtual Service. In the main menu of the LoadMaster WUI, select Virtual Services and Add New. A screen will appear asking to enter the Virtual Address, Port, Service Name and Protocol. The port defaults to port 80, which is the standard HTTP port. If an SSL-enabled Virtual Service is being created, change the port to 443, which is the default HTTPS port. Keep the protocol as tcp, and click Add this Virtual Service. The Virtual Service properties screen will appear. Among the various sections in this screen is SSL Properties. To enable SSL for this Virtual Service, select the Enabled check box. A warning will appear saying that a temporary certificate will be used for the service. Click OK.
As soon as SSL is enabled, the LoadMaster will install a self-signed certificate for the Virtual Service. The checkboxes in the Supported Protocols section allow you to specify which protocols should be supported by the Virtual Service. By default, TLS1.1 and TLS 1.2 protocols are enabled and SSLv3 and TLS1.0 are disabled.default. Starting with version 7.2.37, when re-encryption is enabled, the TLS version that can be negotiated between the LoadMaster and the Real Servers behind it are no longer constrained by the TLS version settings configured on the client side. All TLS versions and ciphers that are supported on the LoadMaster can be negotiated without restriction by Real Servers. In this way, the LoadMaster can, for example, provide strict security for client-side application access and still support server-side connections to legacy servers that only support specific, less secure, TLS versions and ciphers. This is illustrated in the example below. Selecting the require Server Name Identifier (SNI) hostname check box means that the hostname will always be required to be sent in the TLS client hello message. When Require SNI hostname is disabled, the first certificate in the list of Assigned Certificates as a host header match is not found. 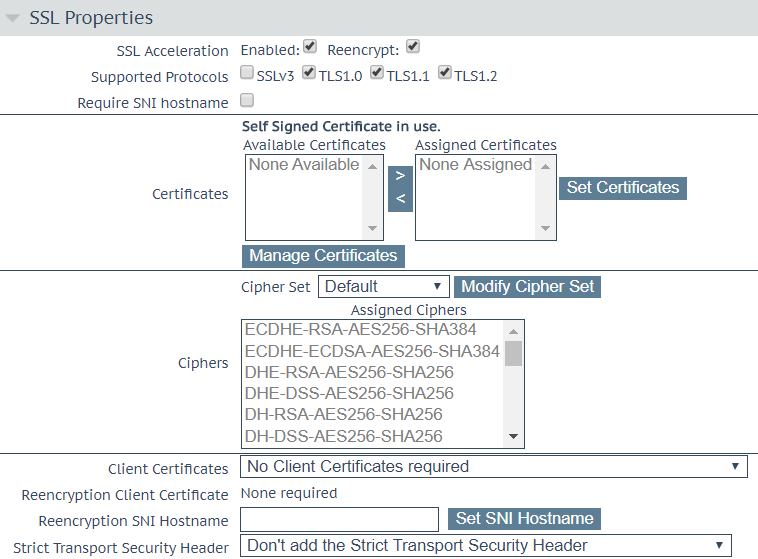 When Require SNI hostname is enabled, a certificate with a matching host name must be found, otherwise the connection is dropped. This also supports wildcard certificates. Multiple certificates are supported. Wildcard certificates work regardless of what position they are in. 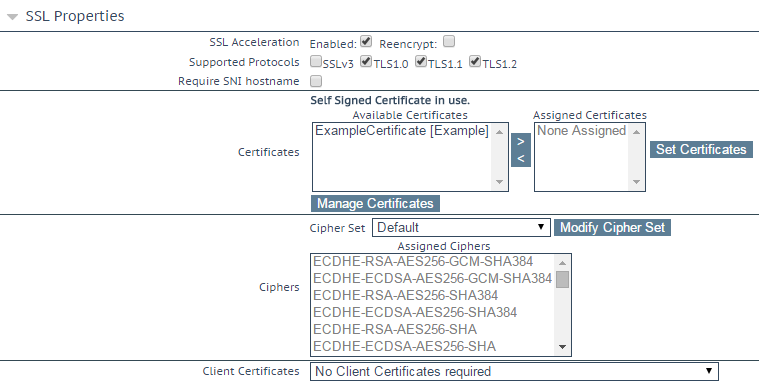 SNI can find certificates by Subject Alternative Name (SAN) when the certificate is not in the first position. SNI will choose the first matching certificate in a list if multiple certificates contain the same name in either the Common Name or SAN name. 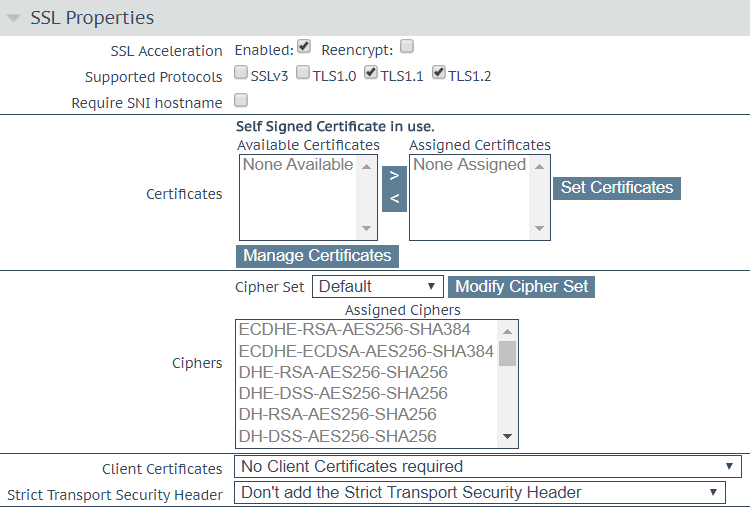 After you have added certificates to the LoadMaster (see the Adding an SSL Certificate section) you can assign one or more certificates to the Virtual Service by selecting them in the Available Certificates list, clicking the right arrow and clicking the Set Certificates button. Both internal and external certificates can be assigned to the same Virtual Service. Client Certificates required: requires that all clients forwarding a HTTPS request must present a valid client certificate. Real Servers can be added to this SSL Virtual Service by clicking Add New in the Real Servers section. When adding Real Servers, ensure to add them on port 80 (or whatever port that the non-SSL service is running on), and not port 443. To add an SSL Certificate, first generate a CSR. A CSR can be created, for submission directly to the signing authority of choice, by using the WUI. In the main menu of the LoadMaster WUI, go to Certificates > SSL Certificates. Enter a Private Key Identifier and click Generate CSR. Fill out the form and create the CSR and private key by clicking the Create CSR button. If you have the CA certificate generated using the step above , or have a custom self-signed certificate, this can be added to the Virtual Service through the WUI. There is a button called Manage Certificates that you can click to add an (RSA or EC) SSL certificate. There is also an Add New button in the View/Modify Services screen in the Certificates Installed column. Either route opens the same screen; the screen to input the certificate information. At this point there are two options; Add Intermediate and Import Certificate. Clicking this button will allow you to add an intermediate certificate as a temporary measure. Browse to where the file is stored, enter the desired name in the Desired File Name field and click the Add Certificate button. When using FIPS in HA mode, ensure to only import certificates when both nodes are up. An entry for the CSR previously generated will be available with the status CSR generated in red font under the Virtual Services column. Click Import Certificate on the right. Click Choose File to select the signed certificate and click Submit. A dialog informing you that the certificate installed successfully should appear. The certificate can then be assigned to a Virtual Service(s) by selecting the relevant IP address(s) in the Available VSs list, clicking the right arrow and clicking Save Changes. Certificates can also be assigned to a Virtual Service within the Modify Virtual Service screen. Some browsers have functionality that allows a check of the nature of the certificate installed on the website being connecting to. This can be useful when troubleshooting a certificate problem. When browsing an SSL site, HTTPS should be displayed in the address and there may be an icon signifying a secure link (a padlock icon). The icon can be clicked to see information about the certificate that is used with that SSL site. Some certificates issued by Certificate Authorities require a third certificate, often referred to as an intermediate certificate, or third-party certificate. This additional certificate provides a chain path from the CA to the certificate issued to your site. While some CAs use intermediate certificates, others do not. Check with your CA to determine if one is needed. If a CA certificate has been installed, and an SSL error appears when browsing the Virtual Service, it is likely that an intermediate certificate needs to be installed. Uploading several consecutive intermediate certificates within a single piece of text, as practiced by some certificate vendors such as GoDaddy, is allowed. The uploaded file is split into individual certificates. Installing an intermediate certificate is simple to do through the WUI. First, obtain the intermediate certificate from the CA. This can usually be found on their web site, and is usually in a text window to make it easier to cut and paste. 1. Navigate to Certificates & Security > Intermediate Certs in the main menu. 4. Browse to and select the required certificate file. 5. Enter the Desired File Name. These third party/intermediate certificates do not need to be associated with any Virtual Service certificates. The LoadMaster will automatically build the required certificate chain. Also, only one intermediate certificate is required per CA. If several certificates have been installed from VeriSign, for instance, you only need to install the VeriSign intermediate certificate once. This section outlines how to migrate SSL from Microsoft Internet Information Services (IIS) to the LoadMaster. When putting a LoadMaster in a situation where a Microsoft IIS server was previously performing SSL, there is an option to import the IIS certificate into the LoadMaster. This SSL certificate can be migrated from Microsoft IIS to the LoadMaster by completing two simple tasks. The first task is to export the SSL certificate from the IIS using Microsoft export tools; ensure to export the certificate and private key as a Personal Information Exchange File (PFX). The second step is to import the PFX file into the LoadMaster using the LoadMaster WUI. To start the import process on the LoadMaster simply click the Add New button in the SSL enabled Virtual Service and install the certificate as per the instructions in the Adding an SSL Certificate section. With SSL acceleration, the SSL session is terminated at the LoadMaster, and sent to the Real Servers unencrypted. In some security situations, it may be necessary to encrypt the connection between the LoadMaster and Real Servers. This can be done with reencrypt SSL. With reencrypt SSL, the SSL session is first terminated at the LoadMaster. Persistence and other Layer 7 functionality can then be performed. After that, the traffic is re-encrypted in a new SSL session between the LoadMaster and the Real Server. This is turned on by a single option in the properties screen of a Virtual Service in the SSL section. 2. Click Reencryption Usage on the relevant certificate. 3. Select the relevant IP address from the Available VSs box. 4. Click the right arrow. 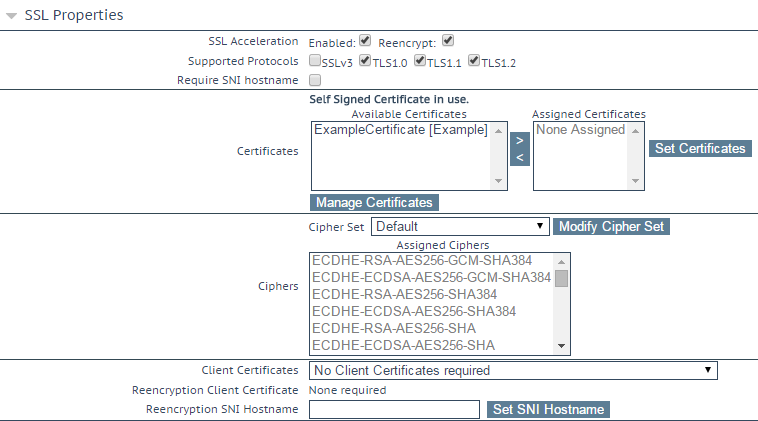 The Reencryption Client Certificate is displayed in the SSL Properties section of the relevant Virtual Service. The LM-8020 supports exporting of intermediate certificates. The export file is designed to be used for import into the same LM-8020 and is encrypted. Export and import can be completed using the WUI at Certificates > Backup/Restore Certs. Please make sure to note the passphrase used to create the export because it will be required to complete the import. The LoadMaster supports SSL 3.0, TLS 1.0, TLS 1.1 and TLS 1.2. Ciphers define how the data stream is encrypted. The LoadMaster supports ciphers supporting perfect forward secrecy and Elliptic Curve. A cipher set also needs to be assigned to the LoadMaster WUI. To set the WUI cipher set, go to Certificates & Security > Admin WUI Access. Each Virtual Service (which has SSL Acceleration enabled) has a cipher set assigned to it. This can either be a system-defined cipher set or a user-customized cipher set. A system-defined cipher set can be selected to quickly and easily select and apply the relevant ciphers. In the FIPS LoadMaster, there are three system-defined cipher sets; WUI, Default and BestPractices. Each of these cipher sets only contain ciphers that are supported by FIPS. By default, the name for the custom cipher set will be Custom_<VirtualServiceID>. KEMP recommends changing the name of custom cipher sets because if another system-defined cipher set is modified, the name will again default to Custom_<VirtualServiceID> and will overwrite any existing cipher sets with that name. Two lists are displayed â€“ Available Ciphers and Assigned Ciphers. These lists can be filtered by typing some text into the Filter text boxes provided. iThe Filter text boxes will only allow you to enter valid text which is contained in the cipher names, for example ECDHE. If invalid text is entered, the text box will turn red and the invalid text is deleted. Changes cannot be made to a preconfigured cipher set. However, you can start with a preconfigured cipher set â€“ make any changes as needed and then save the cipher set with a new custom name. Enter the new name in the Save as text box and click the Save button. Custom cipher sets can be used across different Virtual Services and can be assigned as the WUI cipher set. The RC4-MND5 SSLv3 and RC4-MND5 SSLv3 ciphers are not supported for WUI connections (this is to improve security). The RC4 ciphers are supported with (and can be assigned to) Virtual Services if needed. By default the LoadMaster uses a self-signed certificate to ensure secure administrative access to the WUI. However, most modern browsers will display a warning when such a certificate is used. In order to eliminate this warning, the LoadMaster certificate can be installed by clicking the Download Root Cert button in the main menu on the Home page, when you first access the WUI in a browser. If this button is not visible, go to the WUI Home and refresh the page. This will download the certificate file that can be installed on the browser so that the security warning can be avoided. A Common Access Card (CAC) is a smart card used for identification of active-duty military personnel, selected reserve, US Department of Defence (DoD) civilian employees and eligible contractor personnel. In addition to providing physical access to buildings and protected areas, it also allows access to DoD computer networks and systems satisfying two-factor authentication, digital security and data encryption. It leverages a Public Key Infrastructure (PKI) Security Certificate to verify a cardholderâ€™s identity prior to allowing access to protected resources. The Edge Security Pack (ESP) feature of the KEMP LoadMaster supports integration with DoD environments, leveraging CAC authentication and Active Directory application infrastructures. The LoadMaster acts on behalf of clients presenting X.509 certificates using CAC and becomes the authenticated Kerberos client for services. Authorization â€“ occurs after SSL session establishment and the matching of the certificate Subject Alternative Name (SAN) against the User Principal Name (UPN) of the appropriate principal in Active Directory. For more information, refer to the DoD Common Access Card (CAC) Authentication, Feature Description document. The OCSP server settings can be set in the LoadMaster WUI in Certificates & Security > OCSP Configuration. The address of the OCSP server. 1. In the main menu of the LoadMaster WUI, go to System Configuration > Miscellaneous Options > Network Options. 3. A reboot is required to apply the change. To reboot the LoadMaster, go to System Configuration > System Administration > System Reboot and click Reboot. This section provides a description for each of the WUI options relating to SSL. Enabled: If the Enabled check box is selected, and there is no certificate for the Virtual Service, you are prompted to install a certificate. A certificate can be added by clicking the Manage Certificates button and importing or adding a certificate. The checkboxes in the Supported Protocols section enables you to specify which protocols should be supported by the Virtual Service. By default, TLS1.1 and TLS 1.2 are enabled and SSLv3 and TLS1.0 are disabled. When Require SNI hostname is disabled, the first certificate is used if a host header match is not found. Wildcard certificates are supported but please note that the root domain name will not be matched as per RFC 2459. Only anything to the left of the dot is matched. 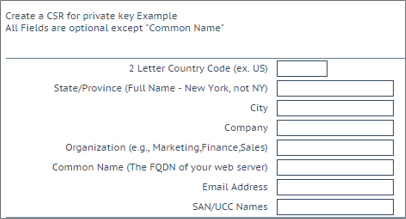 Additional certificates must be added to match the root domain names. For example, www.kemptechnologies.com is matched until a wildcard of *.kemptechnologies.com. Kemptechnologies.com will not be matched. To send SNI host information in HTTPS health checks, please enable Use HTTP/1.1 in the Real Servers section of the relevant Virtual Service(s) and specify a host header. If this is not set, the IP address of the Real Server is used. Available certificates are listed in the Available Certificates select list on the left. To assign or unassign a certificate, select it and click the right or left arrow button. Then click Set Certificates. Multiple certificates can be selected by holding Ctrl on your keyboard and clicking each required certificate. 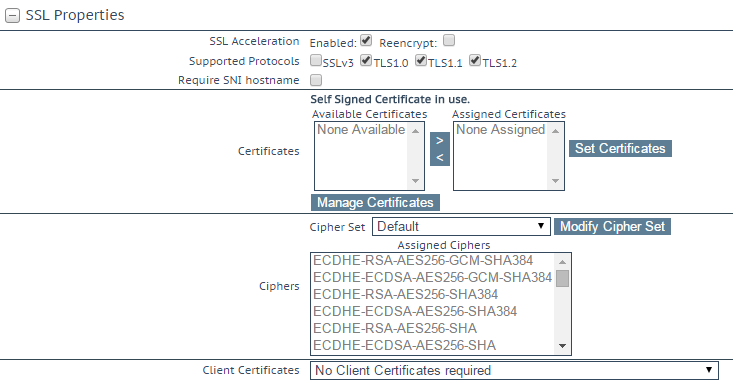 Clicking the Manage Certificates button brings you to the SSL Certificates screen. Each Virtual Service (which has SSL Acceleration enabled) has a cipher set assigned to it. This can either be the system-defined cipher set or a user-customized cipher set. The system-defined cipher set can be selected to quickly and easily select and apply the relevant ciphers. Refer to the SSL Accelerated Services for the LM-8020 FIPS, Feature Description on the KEMP Documentation Page for a full list of the ciphers supported by the FIPS LoadMaster. The Ciphers list is read only and displays a list of the currently assigned ciphers. 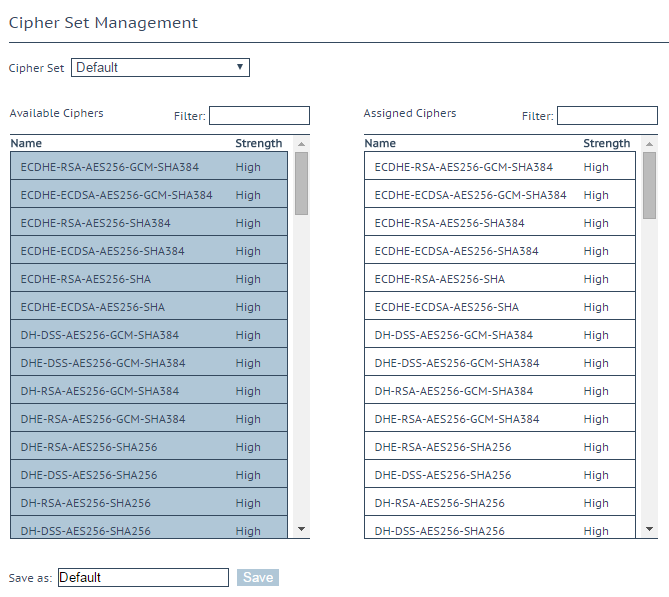 Clicking the Modify Cipher Set button will bring you to the Cipher Set Management screen. This screen allows you to create new and modify existing custom cipher sets. Verify (using Online Certificate Status Protocol (OCSP)) that the client certificate is valid. The sections below describe the various screens in the Certificates & Security section of the LoadMaster WUI. Shown above is the Manage Certificates screen. The options on this screen are described below. Private Key Identifier - to generate a new private key which will be stored on the LoadMaster, enter a name for the private key and click Generate CSR. Add Intermediate â€“ adds an intermediate certificate. Private Key â€“ is the private key identifier given to the certificate at the time it was created. Common Name(s) â€“ is the FQDN (Fully Qualified Domain Name) for the site. Assignment â€“ the Available VSs box lists all of the SSL Virtual Services which are configured on the LoadMaster. The Assigned VSs box lists the Virtual Services which the certificate has been assigned to. The Virtual Services can be assigned/unassigned by selecting them and clicking the right/left arrow buttons and clicking Save Changes. Import Certificate â€“ imports the signed certificate. Administrative Certificate - select the certificate to be used for the administrative interface. Click Use Certificate to apply the changes. Local Machine Certificate - select the certificate to be used on the local machine interface. Click Use Certificate to apply the changes. 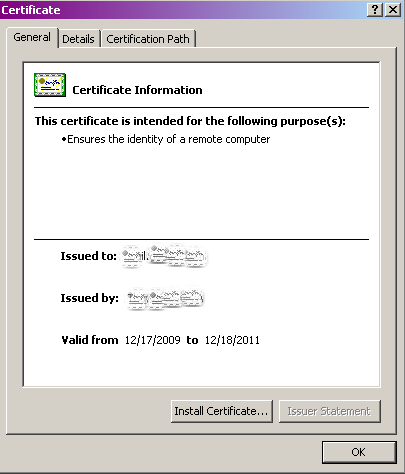 This screen shows a list of the installed intermediate certificates and the name assigned to them. If you already have a certificate, or you have received one from a CSR, you can install the certificate by clicking the Choose File button. 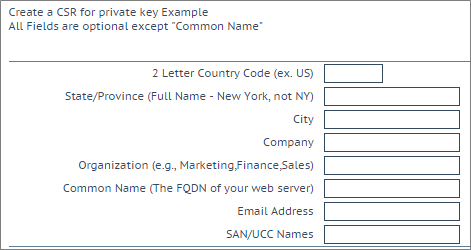 Navigate to and select the certificate and then enter the desired Certificate Name. The name can only contain alpha characters with a maximum of 32 characters. Uploading several consecutive intermediate certificates within a single piece of text, as practiced by some certificate vendors such as GoDaddy, is allowed. The uploaded file is split into the individual certificates. The Manage Certificates screen will appear. 2. Enter a unique name in the Private Key Identifier field for the RSA 2048 key you intend to store on the HSM. The Private Key Identifier is the password. Make a note of it because you will need it. 4. Fill in the details in the resulting screen. The Common Name field is mandatory, all other fields are optional. The resulting key size will be 2048 bits. 6. The CSR is displayed. 7. 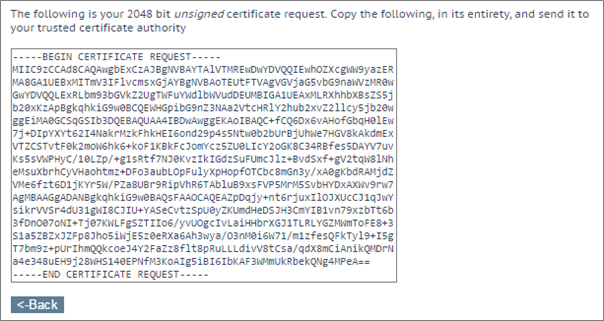 Copy the CSR into a file and send it to your Certificate Authority for signing. The Certificate Authority will provide you with the certificate which will be put on the server. Unlike a non-FIPS certificate operation, the private key is never displayed or available during this process. It is stored inside the HSM, and is completely inaccessible to the user. 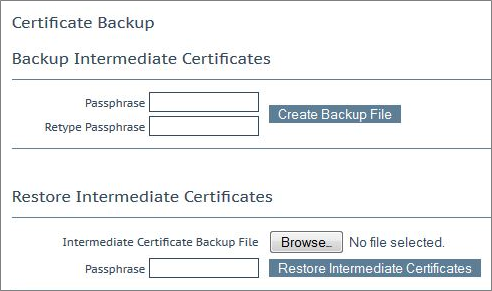 Backup Intermediate Certificates: Create a backup of all intermediate certificates. The backup will be encrypted with the given passphrase. When backing up certificates, a mandatory passphrase (password) needs to be entered twice. The parameters of the passphrase are that it must be alpha-numeric and it is case sensitive with a maximum of 64 characters. This passphrase is a mandatory requirement to restore a certificate. A certificate cannot be restored without the passphrase. If it is forgotten, there is no way to restore the certificate. WUI: This is the cipher set recommended to be used as the WUI cipher set. The WUI cipher set can be selected in the Admin WUI Access screen. For further information, refer to the Admin WUI Access section. Refer to the SSL Accelerated Services, Feature Description on the KEMP Documentation Page for a full list of the ciphers supported by the LoadMaster, and a breakdown of what ciphers are in each of the system-defined cipher sets. Specify how often the LoadMaster should refresh the OCSP stapling information. The OCSP daemon caches the entry for up to the amount of time specified here, after which it is refreshed. Valid values range from 1 hour (default) to 7 days. This document was last updated on 02 January 2018.